Ashes and soot and stains...Oh my! During the cold winter months your firebox, the area of your fireplace where the fire burns, takes a beating. With smoke, soot, and ashes building up after every fire, the firebox looks like an ugly, dirty mess. Painting your firebox can be just the thing to give your fireplace a fresh, clean look. How to paint your firebox in 3 easy steps. 1. First, Purchase Some High Temperature Paint. This type of high temperature paint comes in two types: brush-on or spray. High temperature paint withstands temperatures up to 1200 degrees Fahrenheit. Some people prefer the brush on type since it allows for more control when applying. Others prefer the spray- on since the paint can be applied faster. Either way, be sure you have plenty of ventilation since most of these high temperature paints have a very strong odor until they dry. You’ll need to decide on what color to use since this paint comes in a variety of shades. Basic black is a good choice since it’s a neutral color and can hide soot easily. Also, black tends to look nice with almost any fireplace and room decor. Beige, off-white or almond creates a bright, fresh look and is a good choice if you don’t burn real wood in your fireplace or you don’t use your fireplace at all. 2. Next, Clean and Prep Your Firebox. After the firebox has been emptied, use soap and water and a good firebox cleaner formulated to remove creosote and soot to clean the walls and sides of the firebox. Rutland makes a good brick and stone cleaner that works pretty well. A scrub brush or long- handled sponge should do the job nicely. 3. Finally, brush or spray on the high temperature paint covering the walls, sides and floor of your firebox. Remember to open windows and doors to fully ventilate the area until the paint dries since the odor is very strong. After the paint dries there should be no odor. If you want to keep the“real brick” look of your fireplace but change the bricks’ color, try the Brick-Anew paint kit. This kit shows you how to get a real brick look using several shades of paint. The great thing about this kit is it’s perfect for novice as well as pro painters. Everything you need to do your project is included - 5 shades of paint and tools including brushes, paint tray, and rollers. There’s no trial and error and everything you need for your project is included. If you’re using the Brick-Anew Do-it-Yourself Paint Kit, all the materials you need are included. Just follow the easy, detailed instructions that come with the kit. Now, stand back and admire your fresh, new-looking fireplace! 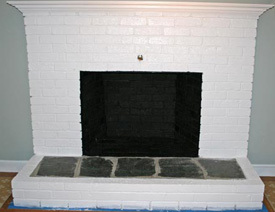 By painting the firebox and the fireplace brick, you’ve saved hundreds and maybe even thousands of dollars compared to what a contractor would have charged to reface the entire fireplace - and you can be proud you did it all yourself!